Star Wars: Battlefront II first impressions – AiPT! Sunday gave us our first in game look at Star Wars: Battlefront II, and while I have my reservations after the first rebooted Battlefront, I’m still pretty excited for November. 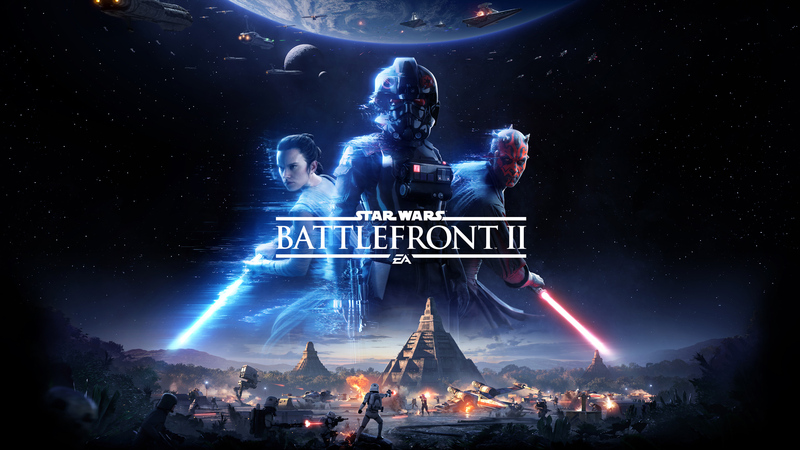 The first notable improvement is that the gameplay, maps and characters are going to span across all iterations of Star Wars films, close to tripling the content from the previous Battlefront. The limitations of going with just the original trilogy for the initial reboot left many feeling underwhelmed and sorely disappointed. It was pretty obvious from the backlash that EA wasn’t going to miss out on encompassing the entire saga the second time around. In addition, EA has also confirmed at least one map from The Last Jedi will be released later this year. The planet Crait. I’m interested to see what this battle may bring. At EA’s Play conference on Sunday, a live pre-alpha playable demo showcased the city Theed along with heroes Boba Fett, Han Solo, Darth Maul and Rey. From what EA has stated, these heroes wont necessarily all play together outside of Hero Battle Mode. They are sticking to canon as far as who you can play on each map. Meaning, you wont see Han Solo running around Theed on the regular, or Darth Maul on the Death Star. I think this is a great idea to bring a little bit of realism to the game and mirrors what they (mostly) did in the first iteration. I just hope Luke Skywalker is finally wearing his proper attire on Hoth. There have been several characters mentioned thus far in addition to those referenced earlier, including Captain Phasma, Finn, Kylo Ren, and Yoda. I’d presume some old favorites will be joining the party such as the obvious Darth Vader. Ideally they will throw in some unexpected surprises like members of the Jedi Council (Mace Windu pls?) or Star Wars: Rebels faces and possibly, although unlikely, Thrawn? It would be mighty cool to have many options for a hero or villain on any given map than just the presumable two. DICE has refined the class system to more defined roles, but is allowing a lot of customization. They even mentioned specifically the heroes being part of that customization. I’m personally really excited for this because I found the first game’s load-out system to be a bit too broad–especially when first starting the game, you barely had any weapons at your disposal. You spent most of your time grinding to buy those weapons just to create the class that should have been there from the get go. But even then, the weapons you can acquire were behind a minimum level, so it took quite a while to even get to the point of unlocking a weapon for purchase you were eyeing early on. This expanded customization also alludes to more skins and the ability to vary individual parts of those skins, but that breadth of this has yet to be touched upon. Like shooting Womp rats from a T-16. My favorite change so far is the way in which you acquire special classes, ships or heroes. In EA’s first take, there were pickups you found on the ground in specific locations. At first it seemed to be dependent on luck (which I would have probably preferred) but quickly realized it wasn’t so random. You just had to know where certain things spawned. Granted, I haven’t put many hours into Battlefront like some others, but I have still yet to play any significant hero in multiplayer. I’ve managed to grab the AT-ST pickup, or Death Trooper, but I’ve never swung Vader’s lightsaber or shot Han’s blaster. I could, and probably should have looked it up by now, but isn’t that something I should be able to find as a casual player? How many people that played the beta decided not to pick up the game because the Luke Skywalker power up was always camped? This time around, you earn points during a map and are spent as you wish. You could go an entire game never playing a hero, because you chose to stick with the jump trooper as that was working best for you. On the other hand, you might save up the entire game for the chance to wreck house as Darth Maul. A much improved system in my eyes. The new, and very welcome, hero select screen. It’s hard to say since only one map has been shown, but it looks like the progression of the battle itself has been improved. In the first, you would have stages of objectives to get through in order to win. To take down the AT-AT you have to bomb it with Y-Wings to bring down its shields, but in order to initiate the Y-Wing bombing raids you have to activate an uplink. Theed seemed similar in this respect, but each stage drastically changed the way the game felt and was played. The further into the map you got, the closer the quarters were. Since people are also racking up points, the more impressive classes and characters start making appearances. There are more ships in the sky and you are starting to see the heroes running around. By the end it’s an all out war with everyone spending their battle points to either hold or take the objective. The biggest criticism that has come out of Battlefront II thus far is microtransactions. EA stated they wanted to do away with expansion passes because it split the player base. They did announce all DLC will be free, but you can still pay for progression and in-game content. One important thing to note though is that all of this can still be earned by playing the game and isn’t necessary to pay for. I for one am happy with this shift, as long as it is done similarly to how Blizzard treats loot boxes in Overwatch. Allow us to earn skins, weapons, and star cards (their system for special abilities) over play time, but if someone wants to spend $5 for more chances at them, I’m okay with that. The one caveat though is EA’s Fegraeus stating “..if you can’t play for a week, you can purchase that”. Is he implying we can purchase levels? Or simply reiterating that any currency you would have accumulated in a week is buyable? I don’t believe levels should ever be bought because it essentially creates a paywall for winning. It may all be a moot point however, because leveling in Battlefront did nothing but grant you access to more stuff. We’ll probably get more clarifying statements to how microtransactions work in the months leading up to the games release in November. Lastly…theres a single player campaign! And…it’s canon! Wait for it…it’s also split screen! The main protagonist you play as throughout the main campaign, Iden Versio. Probably my biggest pet-peeve from Battlefront I was addressed. It looks really interesting too and is played from an unusual perspective: that of an Empire elite soldier. I don’t expect this to span much more than 10 hours, but it’s better than the nothing we got before. I’m going to throw out my prediction that while short, the story is going to be awesome and have serious weight in the Star Wars universe. Disney doesn’t seem to be throwing out any casual stories when it comes to Star Wars, whether it’s movies, TV or comic books, so I don’t imagine this to be much different. Let us know if you like the changes being made for Battlefront II or if you feel it’s turning out to be more of the same old, same old.